Mike Forster, shown in the background, serves up punch made with local rum during Florida Keys day at the Capitol. Forster is vice mayor of Islamorada and owner of the restaurant Mangrove Mike's. He said attendees drink 50 gallons of punch at the event. Kids check out an informational display about lionfish at the Florida Keys day event at the Florida Capitol. Legislators got to skip the long line for food at the Florida Keys day event. Monroe County business owners sponsored the event, which featured shrimp, lionfish, conch fritters, local beer and rum punch. Hundreds of people ate lionfish, shrimp, conch fritters, chicken wings and key lime pie on a stick during the Florida Keys day event at the Capitol. Florida Keys Community College vice president of advancement Frank Will handed out key lime pie on a stick and munched on one himself during Florida Keys day at the Capitol. "It's paradise, and people want to live in paradise, so the price of houses are just going up and up and up," said Islamorada vice mayor Mike Forster, "which is really squeezing out the middle and lower class." Forster is also the owner of the restaurant Mangrove Mike's. 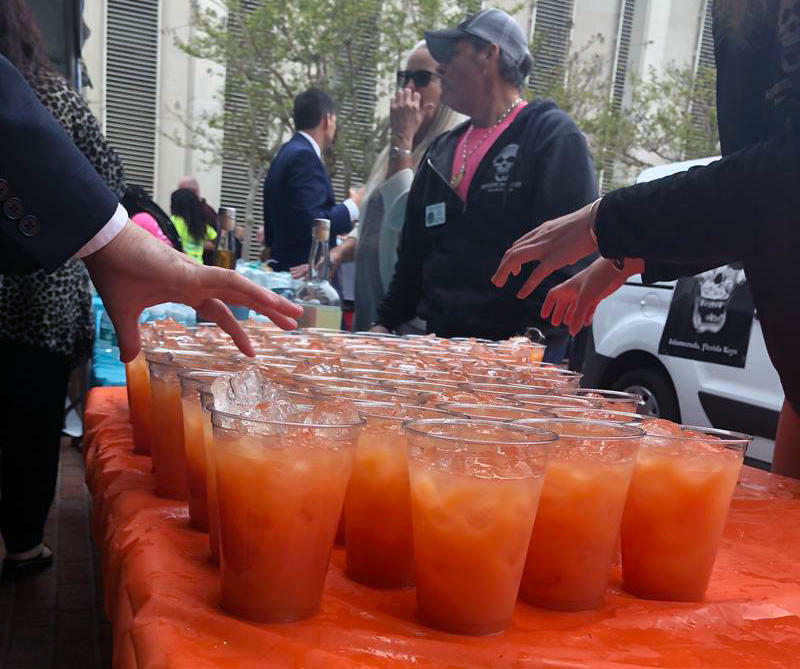 He served up local rum punch at the event — 50 gallons of it. Every year, he said, the event attendees drink it all. Hear the sounds of Florida Keys day.